Eataly was founded by Oscar Farinetti, an Italian businessman who opened the first Eataly location by converting a closed vermouth factory in Turin in 2007. 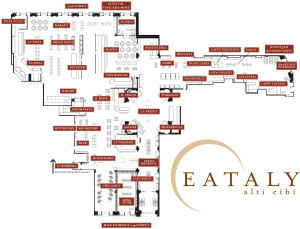 The Eataly in New York City is located near Madison Square Park and owned by a partnership including Mario Batali, Lidia Bastianich and Joe Bastianich. Two weeks after opening, there were still lines extending down Fifth Avenue to get into the store. Eataly’s gross revenue for its first calendar year was $70 million. Eataly in Chicago exceeds 63,000 square feet of retail space, making it the largest Eataly in the USA. Eataly NYC’s Marketplace is open daily from 10am-11pm. Seated counter & table area with a raw bar plus Italian seafood in antipasto and main course portions. Specials are listed on the chalkboards that describe today’s catch. Put your name on the list for a “first come first served” table by going to the seating point located near the fresh pasta counter. Seated counter & table area that serves vegetable dishes including soups, bruschetta and unique warm and cold dishes inspired by the seasonal vegetables & flavors of Italy. Specials are listed on the chalkboard that describe the day’s harvest. Put your name on the list for a “first come first served” table by going to the seating point located near the fresh pasta counter. Rooftop restaurant & brewery that offers the highest quality beer and food under the stars and skyline. Brewing unfiltered, unpasteurized & naturally carbonated Cask Ales 30 feet from where you sit. Each is served through traditional hand pumps, at the perfect temperature, so you can enjoy our beers in the most natural and traditional way. The focus is hearty fare that feels convivial & comforting, like pork shoulder paired with housemade sauerkraut, housemade sausages and meat and cheese plates. Stand up food & drinks bar located in the center of the store serving tastings of salami, cheeses, mozzarella & raw bar, wines by the glass & bottled beer. Available on a “first come first served” basis. Just find a place at one of our standing tables. A server will take your order and bring your food & drink. Two seated counters and a table area that serves artisanal dried pastas & fresh pasta, including tagliatelle, lasagna and ravioli. We also have Rossopomodoro pizza imported directly from Napoli. Pizzas are individual 10” pies & native to this part of Italy. A more formal dining experience celebrating meat from the USA, where you can taste both modern Italian preparations, as well as traditional Piemontese beef antipasti. Get a full meal including antipasti, pasta, a main course and beautifully plated desserts. Reservations: 212.229.2180. A specialty lunch restaurant that focuses on educating guests about regional Italian cuisine. Travel to the Italian Alps, the Mediterranean coast, or the Tuscan countryside on your lunch break with Pranzo’s constantly changing menu. Reservations available online.